It is 1985, and Richard Nixon is into his fifth term as president of the United States. The superheroes (the watchmen), who have been helping the country, are outlawed. They are now in hiding, retired or secretly working for the US government. One night in October, a watchman, Edward Blake—who is better known as the Comedian and who has helped the US win the war in Vietnam—is murdered. And so begins a complicated story that is not only a murder mystery but also a political thriller. 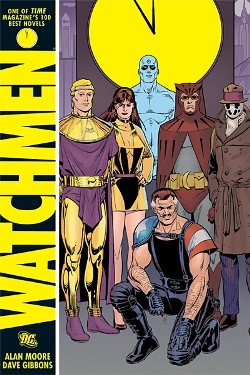 While the Watchmen is a graphic novel set in an alternate reality, it is close enough to actual events to be believable. This is not a conventional superhero story. The watchmen in the book do not have superhuman powers (except for one). They are vigilantes in costume, and most of them are not even particularly likeable. But with their fears and insecurities, they are convincingly real. They do not battle evil from another planet—there is plenty of it on our own. And each one of them carries the demons and emotional baggage of the past. The only one who rises above messy human emotions is Dr. Manhattan, the watchman who has acquired superhuman powers when a quantum physics experiment he is working on goes badly wrong. Dr. Manhattan is the United States’ secret weapon. But when he loses all empathy for humans and exiles himself to Mars, he leaves a void, which sets in motion a nightmare scenario. The book itself is the meticulously kept diary of Rorschach, one of the watchmen. Rorschach is a sociopath with a troubled past and a bleak view of the world but a strong sense of justice. He is the one who brings the watchmen out of retirement to investigate the Comedian’s death. Rorschach is typical of the book’s morally grey world. On one hand, he—like the other superheroes in the book—has sworn to protect humanity. But on the other hand, just by being who he is, he destroys one of the few truly good people in this book, the prison psychiatrist Malcolm Long. You follow Long’s descent from cheerfulness to despair, and it’s heart-breaking. The book draws you into its world. But be prepared: this world is neither safe nor even good. It is violent and nasty, the sort of world that would require the watchmen. But can you trust superheroes—who are intrinsically flawed—to do what is right? And what would happen if we really had superheroes? The plotting is intricate and satisfyingly complex, as are the characters, who stay with you a long time after you’ve finished reading. Unlike other superheroes, who I find are entertaining but relatively flat, the watchmen grow over the course of the book. And the attention to detail, both in the storytelling and the drawing, makes it all come alive. One of the things I love about this book is that several of its minor characters, like Malcolm Long, are well-drawn and memorable. It is not for nothing that the Watchmen has been consistently voted best graphic novel. It’s the kind of book that could have easily become a franchise, but fortunately, Alan Moore refused to write a sequel to it. My only quibble is with the Tales of the Black Freighter—a comic book within the Watchmen—which is read by one of the characters and extracted here. I didn’t get the point of including it in the novel. It is unnecessarily gory and did not in any way add to the book. Anyone who still thinks graphic novels are simplified picture books for children should read Watchmen. Written in the mid-1980s, it is still relevant as a political commentary. Read this book. I promise, it will give you a lot to think about.